Harlow Playhouse panto Aladdin shows that they are the greatest showmen! IF you are going to perform the Greatest Showman at your pantomime, then you better be…great. 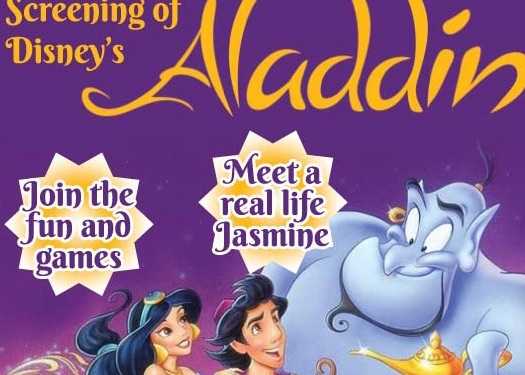 This reviewer can confirm that they had a great time at a great show called Aladdin at the Harlow Playhouse. Through their social media channels, you get a great appreciation of how much hard work goes into the Harlow Playhouse pantomime, so we are pleased to report that all that hard work has paid off with a panto that is so entertaining, so energetic and leaves you calling for more and yet you go away very happy indeed. The core of a Harlow Playhouse panto, once again, is the ability and the enthusiasm when the cast interact with the audience. The key quality is that it is so natural. On this occasion, this was really good news for all the audience except for Steve! Ben Parsley played Wishee Washee and really got the audience involved. It was quite a sight to see so many people doing the DAB! Jimmy Burton-Iles was a great Widow Twankey, really leading the production and being the anchor that gave the show its strengths. There was a great baddie in Abanazar, played by Richard Munday. He was the baddy who is tricking Aladdin and Wishee by saying he is their long lost uncle so he can trick Aladdin in getting him the magic lamp. He was really well played and had the crowds booing like mad! Bernadette Bangura played the genie of the lamp, a great character, really bubbly and energetic. She turned Aladdin into a prince, so he can get the woman of his dreams, Princess Jasmine. We must also mention Jamie Jukes who plays Aladdin. He is so charming, so personable and lights up the stage with his passion and charm. The quality of Laura Darton’s (who plays Princess Jasmine) singing voice was worth the ticket price alone. Our nine-year-old colleague was just left awestruck by the power, beauty and range of Laura’s singing. Terry Burns plays the emperor of China. He is Princess Jasmine’s father. He plays a very protective role and doesn’t want his daughter to marry anyone other than a prince. Terry came across very well. At this point, we will praise the musical numbers. As we have already mentioned, the performance of The Greatest Showman was a real “show-stopper” but so was “Hot Stuff”, “Working 9-5”, “Respect”. “Holding Out For A Hero”. All sung and performed with great gusto and all greatly enhanced by perfect choreography and vivid backdrops. Speaking of which, this reviewer will never fail to admire or be impressed by all the work done behind the scenes but especially by the hard work that goes into building the sets, as well as designing and making the costumes. A great show often starts with a needle and thread! This reviewer must admit that their favourite part was when Aladdin came flying in on the magic carpet. The whole set looked amazing. The children thought it was magical and that is the essence of a truly successful panto when it brings a big dose of magic into the lives of all the audience. For many, the Harlow panto sets up their Christmas. It truly can be said, that Christmas hasn’t arrived in Harlow until you have seen the Harlow Playhouse pantomime.